I‘ve seen some great St. Patrick’s Day ideas around that I thought I’d share with you! Amy of Living Locurto has made some adorable St. Patrick’s Day cards, tags and notes you can download and print for FREE! Thanks Amy! Janet of From Captain’s Daughter to Army Mom is getting her Irish on by teaching some of her friends how to decorate cookies by baking and decorating some awesome shamrock cookies! went out of her way to Send me this cookie cutter! Blogging is SO rewarding when you realize the friendships that grow and the generosity of others! Janet has been known to be a very generous blogger, not only what she shares on her blog, but the friendship she has shared with me and others………please pray for her family, as her brave son, Brandon has recently left to fight for our country! Brandon and his family could use your good thoughts and prayers for a safe return home. I also want to introduce a new TidyMom sponsor, The Rusted Chain! Be sure to click over and check out the fabulous jewelry……..and keep your eye’s peeled for a giveaway later this month! Cool links! Those shamrock cookies look so yummy. To Brandon: Thanks so much for serving our country. I will keep you and your family in my thoughts and prayers! Oh how I just loved those Shamrock Cookies of Janets! I am always amazed at her kitchen…I like STUDY it in all the pictures! She has the neatest gadgets! What a precious precious soul. Oh the friendships that just POP their way into your world through the BIG world of BLOGGING! Thank you for your mention of my sweet boy. Love these links!!! The cupcake toppers…*swoon* and Janet's cookies!!! I wish we all could have been there! Is today your birthday! 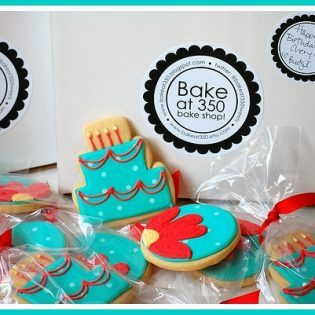 I just saw the most beautiful cookies for you from Bake at 350! Those look so yummy, you must have been so excited to receive them! I love the cookies Bridget made for you, they are as sweet as you are! Thanks for the mention, I really appreciate it. Janet is so generous…and her cookies came out fabulous!!! Hope you are finding plenty of time to celebrate your special day! Wow, your cookies are lovely. I was hoping some of the tidy would wear off if I follow your blog…so I am now! I'm new to your blog. These are really cute! I especially love the cupcake topppers. Thanks for sharing! You are the BEST cookie maker/decorator! These are gorgeous Cheryl!